Who attacks whom? The roles are changed. The initial question was if Black should reduce with a or invade with b. Later, though, the debate expanded to the question whether the big point c has priority over the lower side. The temperature of the lower side is affected by the possibility of a corner invasion at d and the protection of it at e.
The invasion of was commonly judged abusive or at least counter-intuitive and unnecessarily complicating things. Conventional wisdom urges to drive the black stone towards White's thickness at the left. A more prudent approach at b was also suggested. Some voices went against conventional wisdom and advocated the expansion of White's framework, sacrificing the White stone at the highest possible profit, playing d or e.
Another possible answer, the corner invasion at c was also suggested and thoroughly analyzed. With a possible continuation like this. takes the big point while attacking Black's center group. Black attacks gladly with . Being behind in the running fight does not allow white to play . If White jumps, Black can attach at a. The continuation is yet to be discussed. The corner invasion is not such a good reply, because Black forces White to a low position and puts his invading stone to good use. This way Black goes too easy on White. White's cut off stone still has potential. Sacrificing and expanding the framework seems to give Black easy territory but the expansion is an original approach. If Black reduces the White framework while expanding his own, White can do likewise at the other side at a, or reply to with b or c.
probably is too mild, leaving the other expansion to Black as well. 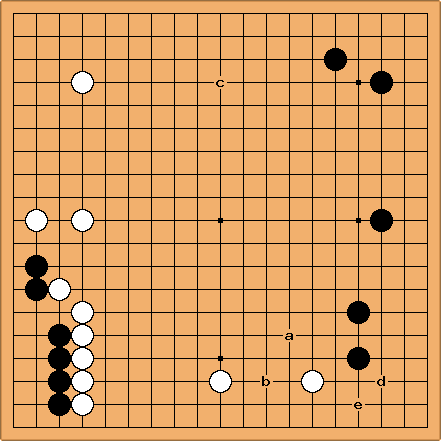 If enters the corner, Black takes the initiative to play again. If takes the other expansion point, Black can attack at . makes points while continuing the attack. A difficult local position follows. is big, but is probably bigger. The conclusion is that the choice for reduction/expansion at the bottom is probably best, because it is one of the two strategic points for expansion of both the Black and the White framework, being the one with the more severe follow-up. dnerra: The other conclusion is, just in my opinion, that noone among us is strong enough to decide how to deal with the invasion at the bottom. To me, both the running fight started by the diagonal move, and the variations building up a moyo while sacrificing the white stone in the lower right, look playable. But if a 7d entered the room I would become silent very quickly, ask him about his opinion, and not be surprised if he dismissed one of them. Bill: I think that two things tip the scales in favor of Tderz's keima. 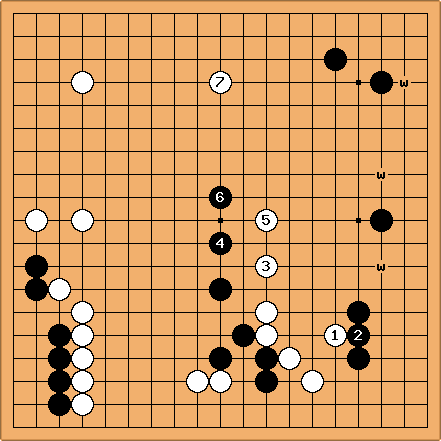 First, it is White who is expanding her moyo and reducing Black's, instead of the other way around. Second, White still keeps a lot of aji in the bottom right. dnerra: But on the other hand, the two keimas have a lot of weaknesses. And I could well imagine that the running fight is actually advantageous for White, because the effect of White stones on Black's formation on the right is bigger than Black's effect on White's wall on the left. Can you judge who is weaker in this fight? I cannot, and I would not trust an EGF 5d who claims he can.